The digital age has presented humanity with a plethora of benefits – the World Wide Web is right at our fingertips and the smartphone has become an extension of the hand. But advances in technology are taking their toll on the human body as people spend an increasing amount of time looking down at an angle and straining the spine. It’s not just phones, either. Such strain can also be caused by computer usage, and the growing epidemic is prompting people to sit up straight and embrace the benefits of ergonomic workstations. Whether you realize it or not, the position of your body when using a handheld device may be causing you pain, including headaches, sore shoulders and neck cricks. After all, many people spend hours looking down at their phones and tablets, either slouching back in their chairs or leaning forward with the shoulders curved and neck bent forward. This poor posture issue, called “text neck,” is becoming a widespread epidemic that could cause permanent damage to countless people. 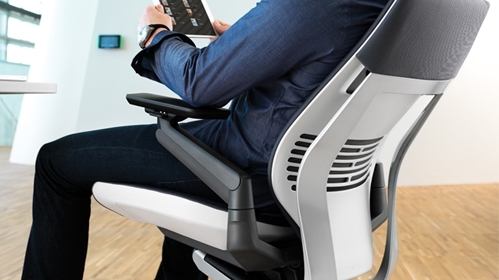 Ergonomic workstations can help workers find relief from text neck. A 2014 study published in the National Library of Medicine looked deeper into the effects of tilting the head forward for too long. It revealed that the human head, which generally weighs about 10 pounds, puts double the weight pressure on the spine for every inch you tilt your head forward. So when you’re looking down at your phone at an angle of 30 degrees, you’re putting 40 pounds of pressure on your spine. That’s like carrying three bowling balls on your neck for hours per day. The long-term effects are scary: By creating stress on the cervical spine, text neck can reverse the spine’s natural curvature and lead to premature wear and tear. Such degeneration is not only painful but can lead to immobility in severe cases, requiring costly and exhaustive surgery to restore function. As the study notes, good posture is when the ears align with the shoulders, which are pulled back so the shoulder blades are retracted. This alignment can ease stress on the spine, which in turn reduces pain. 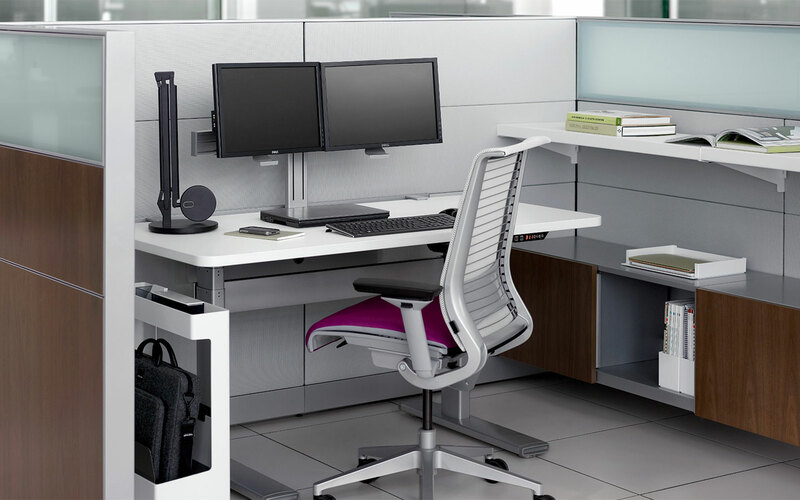 Ergonomic workstations promote good posture among employees – ergonomic chairs support the natural curvature of the spine, while adjustable height desks allow you to raise or lower the desk so that the keyboard, mouse and screen are at the optimal spots for each person’s specific needs. Also, sit-to-stand desks encourage workers to change their positions throughout the day so the spine gets the movement and flexing it needs. 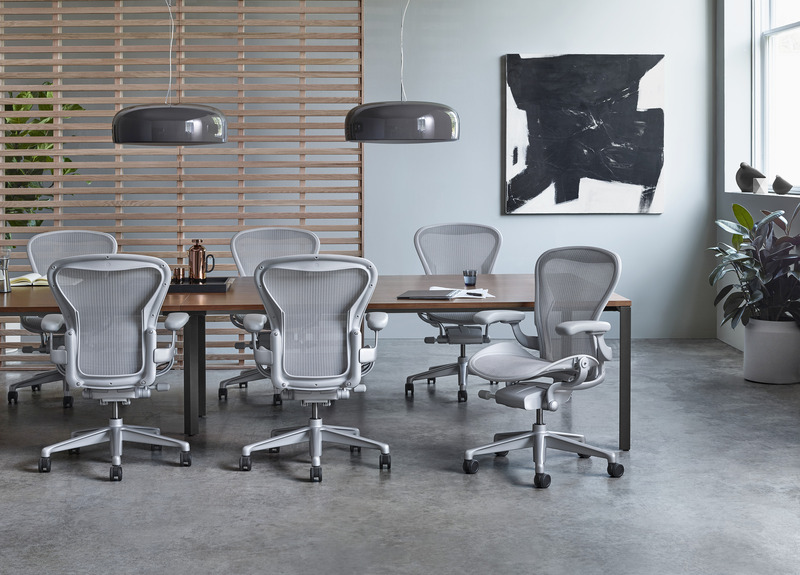 Office Designs carries a wide array of ergonomic office furniture from some of the most trusted brands on the market, including Herman Miller, Steelcase and Humanscale. 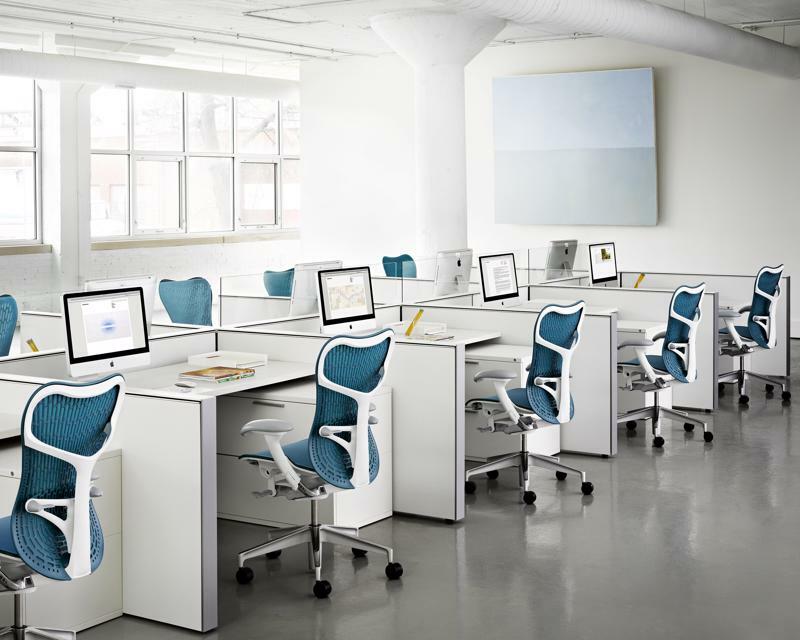 Ergonomic office chairs such as the Herman Miller Mirra 2 promote good posture and support the spine’s curvature. 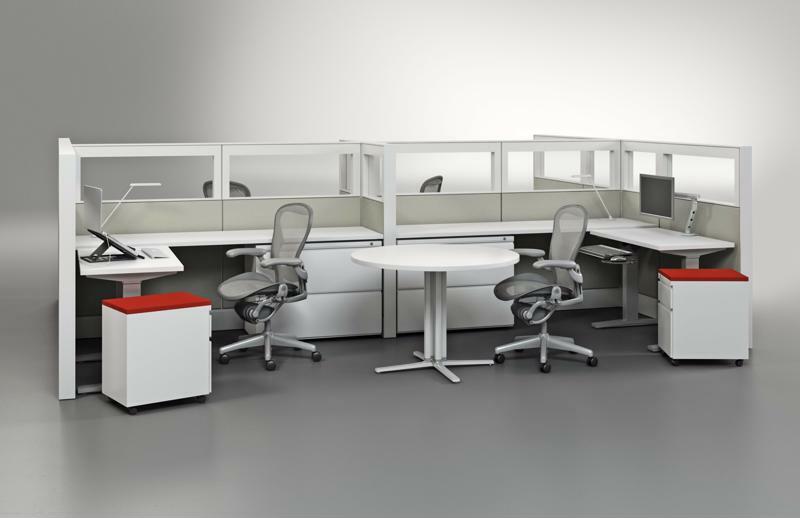 Ergonomic workstations may seem like a big investment to employers, but the potential for ROI is worth the cost, as good posture comes with a lot more benefits than pain relief and spinal health. 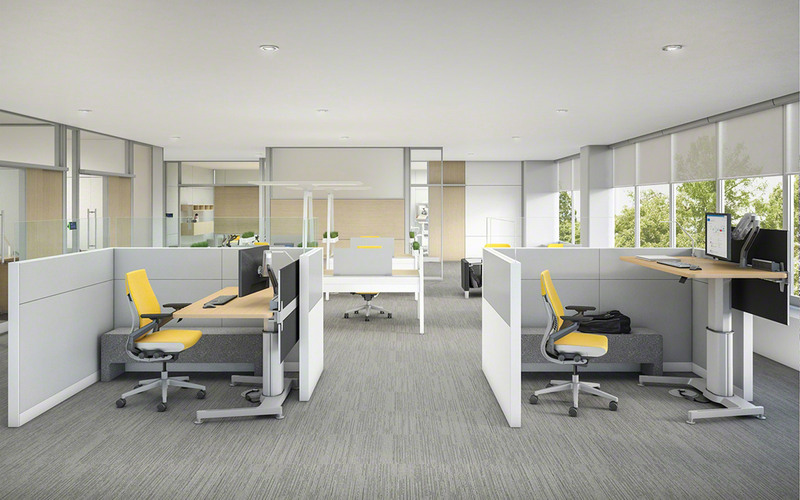 Ergonomically designed office furniture promotes good circulation and helps people breathe deeper, and researchers have recently found that the right posture can increase levels of the happiness hormone serotonin. These perks can boost energy, enhance mood and, in effect, improve productivity, creativity and morale in the workplace. After all, investing in the well-being of your workers is investing in your business.